Do you have a special day coming up on your calendar, perhaps a wedding you want to make extra special, maybe a birthday celebration or even a larger event? Whichever one of these apply to you catering is always a problem you could really do without, hog roast Cardiff is here to offer you an alternative form of catering without all the hassle and drama of making menus, seating arrangements or tricky eaters, we want to make sure everyone is satisfied at your event with minimal fuss and minimal effort combined. Hog roast Cardiff is the leading catering company of this kind in the local area, we offer you the very best service possible with a fresh outlook on how to break the standard catering barriers down without breaking the bank, we know how costs can escalate easily when you have a lot of guests coming to your event, hog roasting simplifies everything for you making sure the only problem you have is making sure everyone’s glass is filled. Hog roasting has been around for centuries and is an age old tradition of slow cooking produce for maximum flavour and to ensure the meat is the most tender you have ever tasted, we guarantee once you have tasted this form of cooking you will be wondering why you hadn’t ordered your own hog roaster for that dilemma free day. 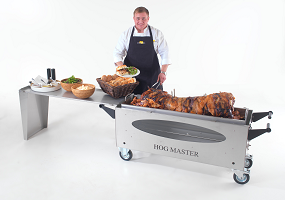 If you enjoy cooking yourself and you don’t fancy paying for our first class service which I might add is second to none maybe you could hire your own hog roaster and do the cooking yourself hog roast hire Cardiff can provide you with your very own spit roaster at your chosen venue no problem at all. We set the machine up for you and all you do is watch the spit turn and the juices start flowing, how will you season it? In Honey, perhaps Salted or with the huge variety of herbs and spices out there perhaps Moroccan or oriental the list is endless so pick the flavours best suited to your day and go from there. There really is no better feeling than watching your guests feast on your food and hear them say how delicious and soft the meats are you really will be talk of the town so let hog roast hire Cardiff make your day that bit more special than your standard BBQ. We want to please and make sure your day whatever the occasion may be will run effortlessly and smoothly with a reliable team at your service, all of our employees are warm, friendly, professional and very approachable. They are also happy to answer any questions you may have about what produce we use, where it comes from and the story behind it, every piece of meat and produce has a story behind it which makes the food taste that little bit sweeter. All of our staff are trained to the highest standards and are up to date with all the latest regulations in the food Industry. All our produce and meats are sourced locally to Cardiff ensuring the meat arrives fresh, straight off the field, unfrozen to ensure the meat is as new and tender as yesterday. All our meats are killed humanely and are treated correctly, none of this battery farmed produce that seems to be the fashion of today. Not only do we offer pig for the spit but we have many other meat alternatives including the tastiest Spring lamb seasoned with mint or whatever you decide for that succulent, juicy taste, we also offer you beef seasoned how you like for that extra meaty taste, not only that but there are other meats available with a white meat substitute from turkey to chicken, our hog roast machines really are that versatile we can cook nearly anything on them giving you a wider and broader choice than one might think. Salads and such are available for vegetarians making sure everyone is provided for. So what are you waiting for? Hog roasting Cardiff can also feed a high or low number of guests with one pig easily feeding 100 guests, imagine trying to prepare a menu for that many people when all you needed to do was give us a quick call, our roasters will fit basically anywhere from inside to out making sure that even if it rains your food will be prepared and ready on time no matter the weather, hail or shine a hog roast tastes fine.